With one of the largest industrial kitchens in the Southwest and five charitable dining rooms, St. Vincent de Paul is able to serve over 1.2 million meals to hungry families and individuals each year. Looking for a Dining Room? Healthy meals range from tasty burgers to hearty stews. Meals are served by volunteers who know the guests by name, and vice versa! The Dream Center corner of our Family Dining Room provides food for thought and imagination. We strive to make every meal nutritionally balanced. 468,000 families are in need across Arizona. Our Dining Rooms give those in-need a chance to have a sit-down meal, but it's not enough. Donate today and have food served to them. When you visit us to serve or be served, it's rarely just about eating. Volunteers create an experience many of us take for granted, an opportunity not only to eat but to meet and greet as well. It's also a chance to discover other ways to help our guests. Stomachs and hearts are filled in five dining rooms, where 3,500 nourishing, hot meals accompany our hospitality every day. Thanks to recent donor generosity, our Family Dining Room now offers many of the amenities of a supportive home or school atmosphere, including communal reading and group art projects for our younger guests, plus one-on-one tutoring programs and fun educational activities. Can you cook? Maybe wait a table? Our dining rooms have limited staff. 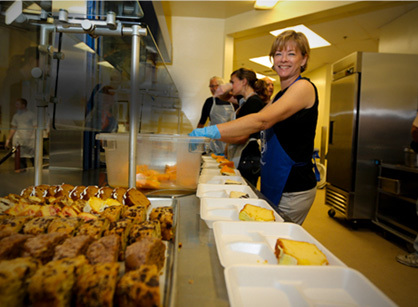 We rely on hundreds of volunteers to prepare, cook and serve meals to hungry guests. You can help too. We operate five dining rooms across the Valley. Duties include set up, serving, bussing tables, and clean-up.